This novella was such fun to read! Don’t be fooled by the Hallmark channel-esque feel in the first half of the book – things start to seem a little peculiar soon after and the story takes a dramatic turn that thrilled this supernatural/paranormal fan. And to make things even better – the black cat is the hero! As a cat fan (particularly black cats) this only added to my enjoyment. Likable characters, a mountain setting at Christmastime – all you need is a cup of hot chocolate before curling up with this book. 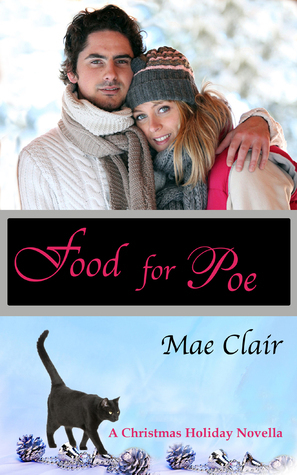 If you’re looking for a quick, heart-warming holiday read to get you in the mood, you can’t go wrong with Food For Poe. Who’s ready for snow? You’re welcome, Mae – it was such fun to read and perfect for this time of year. Enjoyed the review and love Mae Clair’s work. I’ll have to get this one. Stella (feline) says hello. I’m infatuated with the idea of a cat named “Poe”… so I’m already on the hook. Hugs. Isn’t it a perfect name for a black cat? That sinister creature threw a real kink into the Christmas plans!